Combine our Kalo Hair Inhibitor with any hair removal products to achieve permanent hair removal. It is simple, easy and safe. Gently press the pre-waxed strips onto the area and then pull-off. Does this product come with a wax warmer? 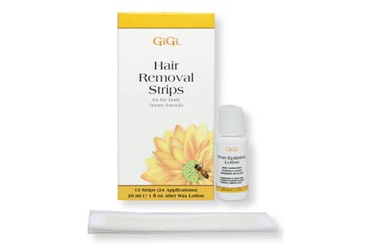 I am only looking for wax strips which gigi wax kit should I purchase? If you are looking for wax strips for the face use this product here. If you are looking for stips for the body use this product here. Is this a sugaring kit or does it use hard wax? This is a brazilian waxing kit and uses a hard wax system to remove the hair. If you are unsure about using hard wax practice first on your legs for application. There are directions included in the package to help you with the application. Is this kit safe for bikini waxing? Yes all kits are safe for bikini waxing as long as you follow the provided directions included with the strips and the kit. If you have very sensitive skin you may want to look into another option for hair removal if waxing causes irritation. Am I able to use the strips for eyebrow waxing? You can use the strips from the facial waxing kit to help remove hair on your eyebrows. 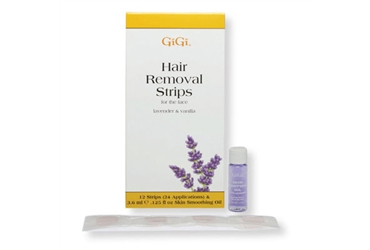 I am looking for more hair removal products where can I find those? Please take a look at our main Kalo Hair inhibitor Page which includes other depilatory devices and kits.